Pretend to journey through the snowy mountains with Anna and Sven! 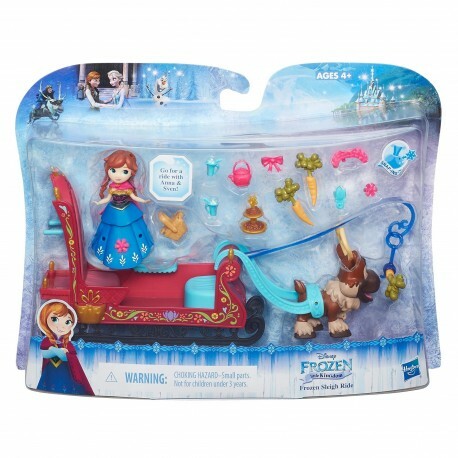 This Frozen Sleigh Ride playset features Anna in her travel outfit with a removable bodice, skirt, peplum, and cape. Girls can attach Sven to the sleigh, pack treats in the trunk on the back of the sleigh, and sit Anna in her snow-ready ride with a cup of hot cocoa. Even Sven has his own treat -- a carrot dangling in front of him! Your little dreamer will have so much fun decorating her Frozen character with mix-and-match Snap-ins and outfits (sold separately). • Includes playset, doll, bodice, peplum, skirt, cape, 4 Snap-ins, and 7 accessories.